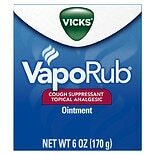 Shop Vicks VapoRub Cough Suppressant Topical Analgesic Ointment Original (1.76 oz. )1.76 oz. $799$7 and 99 cents$4.54 / oz. 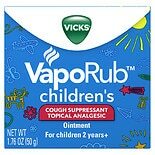 Shop Vicks Child VapoRub (2 oz. )2 oz. $679$6 and 79 cents$3.86 / oz. Shop Vicks VapoRub Lavender, Lavender (1.76 oz. )1.76 oz. 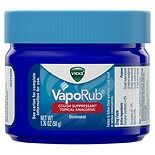 Shop Vicks VapoRub Cough Suppressant Topical Analgesic Ointment (3.53 oz. )3.53 oz. $1149$11 and 49 cents$3.25 / oz. 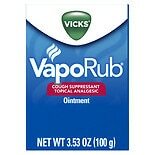 Shop Vicks Vaporub Cough Suppressant Topical Analgesic Ointment Original (6 oz. )6 oz. 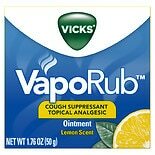 Shop Vicks VapoRub Cough Suppressant Topical Analgesic Ointment Lemon (1.76 oz. )1.76 oz. For an effective way to relieve coughing and minor aches, keep a jar of VapoRub handy. This topical ointment is applied directly to the chest for inhalation of its soothing vapors. Since it's not a medication, you don't have to worry about side effects in yourself or your children. Choose the size and scent of VapoRub you'd like here at Walgreens.com. Many households use VapoRub for cough and cold relief, but it can also be applied directly to the skin in areas that are sore and achy. This can help relieve joint pain and muscle pain, whether they're related to a common cold or flu or not. In addition to the original scent, Vick's VapoRub is also available in lemon scent, so you can choose what you prefer. 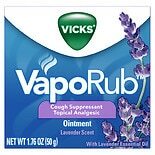 Vick's, the makers of VapoRub, offers a variety of other medicines and treatments for the cough, cold and flu. There are cough relief liquids for both day time and night time relief, as well as soothing cough drops. Thermometers and mediscopes can help you keep track of your and your family's health. For easier and more comfortable breathing, browse Vick's vaporizers and humidifiers as well as medication for use with these devices.